I recently visited the state of Tennessee whilst on my Trek America tour back in May. I had always wanted to visit Tennessee, though I had no idea what to expect from my time there, which was rather exciting for me! Having visited 12 states in the USA so far, it's safe to say that Tennessee is probably one of my favourite states I've visited in America. There was something about being here I loved so much, whether that was the people, the hospitality, or the variety of places to see there, it was all so fabulous & I honestly loved everything this state had to offer. 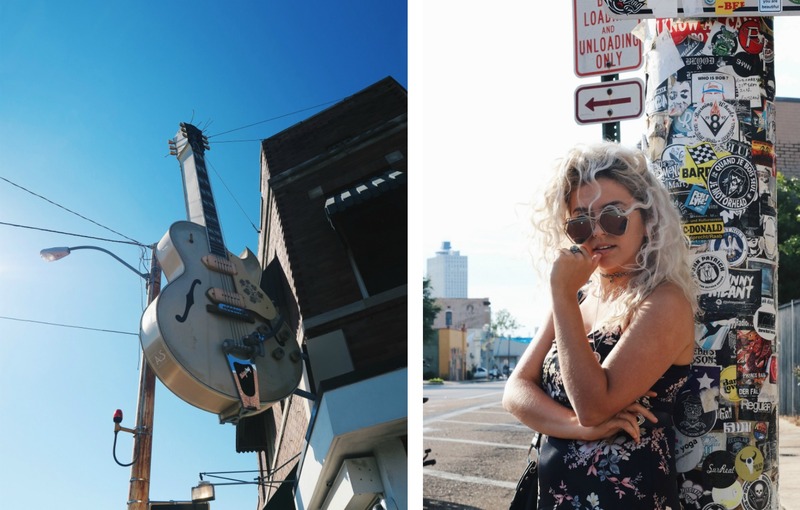 I could write all day about my favourite things to do and see in Tennessee, though I've rounded down my must see's for you guys below. Gatlinburg, a mountain town situated in East Tennessee was our first stop as we headed into the state up from Alabama. It's the main gateway to the Great Smoky Mountains, which is actually the most visited national park in the whole of the USA! Yep, even more popular than Yosemite would you believe. Did you know that the Smoky Mountains is one of two place in the WORLD where you can witness the synchronous fireflies phenomenon? INCREDIBLE. Visiting the Smoky Mountains was our main reason for visiting Gatlinburg too, we wanted to explore the views that the smokies had to offer, though sadly the weather had other plans for us. During our time in Gatlinburg we experienced some crazy gail force winds up to 70-80mph, which isn't so safe to be out in a national park in, or anywhere for that matter! So although the park was closed for the couple of days we were there, that didn't stop us exploring what else Gatlinburg had to offer! There is so much to do or see here throughout any weather condition! There are such a range of attractions, which are perfect for families & people of all ages. If you are planning to visit the smokies, I HIGHLY recommend you stay in Gatlinburg for a few nights, there are so many incredible places to eat here. I in particularly loved Crockett's Breakfast Camp, be prepared for some crazy American portions, and don't forget to order the cinnamon bun! It's truly remarkable! Ah Memphis. Home of Graceland. As soon as we headed to Memphis from Nashville, Graceland was our first stop of the day. Did you know that Graceland is the second most visited house in the whole of the USA? (First being the White House of course) Graceland racks in over 650,000 visitors every year. Crazy! I can totally understand why people want to visit here after seeing the mansion for myself. Entering Graceland with no obsession with Elvis, left me leaving with a beginners obsession with Elvis. In fact the whole trip to Memphis left me with a arrow through the heart for the king. I can't fully describe it, but I left with so many emotions, and so much appreciation for Elvis, it was a beautiful feeling. Make sure you put Graceland on your bucket list, even though it's a bit of a hefty ticket price I'd say it's worth it purely for the feelings that began rushing around my body. I learned so many things about Elvis that I wouldn't had taken the time to learn about else where. Graceland has so many new additions that were recently put into action earlier this year, which includes new stores, cafeterias & exhibitions. I felt incredibly moved from my time at Graceland, & I couldn't recommend it enough for people to visit, whether you're a fan or not. DID SOMEBODY SAY MOONSHINE? Oh my goodness, what a fun experience this was during our time in Gatlinburg. This is where you will find some of the greatest Moonshine distilleries here in Tennessee. We were fortunate to visit both Ole Smoky & Sugarlands for some serious moonshine tasting. How does one describe the taste of moonshine? It's one of those things you HAVE to try for yourself. I'm not a big drinker myself, but being in Tennessee, you just have to go Moonshine tasting! Each distillery had something different to offer with its unique tastes and flavours, there are so many different flavours, it blew my mind. Imagine drinking peanut butter & jelly flavoured alcohol? Or peach? Or butterscotch? THE LIST GOES ON. These distillery taste tours are open for everyone, so you can head on up to a bar and be given an array of flavored shots by a very friendly (& usually very humorous) local Tennessee bar man. The percentages of these shots range from 20% to a crazy 64%! I ended up leaving with 3 HUGE jars of Moonshine to take back to the UK with me... my nan loved the peach! Nightlife in Nashville. NIGHTLIFE IN NASHVILLE IS INCREDIBLE. I've always heard great things about the nightlife in Nashville, but I didn't really realize how great it could be. On our only night in Nashville, we headed out to Broadway to check out the nightlife for ourselves. This strip was HEAVING, I couldn't believe my eyes how many humans were out filling up these beautiful sounding bars. There is so much live music to choose from down Broadway, you can pop in and out of many bars to check out what the strip really has to offer. There was one club I really loved, where it had 3 floors of live music, absolutely packed out with people wanting to have a great time - the energy was unreal. The band we watched were Nashville locals and played often, with their own music and classic cheesy American boy band covers - it was SO much fun. Americans in Nashville know how to let their hair down without caring about being judged, no one was staring at how anyone else was dancing & no one looked unhappy either, everyone was in such a free flowing mood it was so incredibly refreshing to witness. I'll never forget my night out in Nashville, thanks for the memories, Broadway! I think the studio tours from our visit to Tennessee has to my my #1 must see. There is SO much musical history in this state, I never realized just how much Tennessee has to offer musically. The RCA Studio B tour in Nashville blew me away. We had a fantastic private tour from a guy who was heavily involved with the Music Hall Of Frame attraction in Nashville, who took us back in time taking us around the very same studio artists such as Elvis, Dolly Parton & The Everly Brothers recorded in. It felt incredibly surreal to be standing within the same walls of these stars, where hundreds of hits have been produced. It was such an interesting tour, especially when your tour guide is incredibly enthusiastic and is passionate about what he's talking about, it really does make all the difference! If you happen to visit Tennessee for your first time, make sure you check out some of my recommendations above! I feel so incredibly happy to have visited this state with Trek America this year - it's definitely been a huge highlight of 2017 so far for me. Trek America offer a Southern states tour called the Deep South BLT - it's the exact route we trekked, covering the 3 incredible stops in Tennessee I mentioned above, as well as trekking to Alabama, Mississippi & Louisiana! I HIGHLY recommend this route, I didn't think it was possible to love the deep south as much as I do! Book a Deep South Tour with Trek America here! I'd love to hear your thoughts on my post, make sure you stay tuned for my further Trek posts! Today is my lucky day! Fist I have found this awesome Rushmyessay discounts and now I am here, reading about those beautiful places to visit in Tennessee! I was planning to go there next month and now I have a lot of ideas what to do and where to go. Thanks a lot!